We were fortunate to receive some recognition from our local newspaper this week. It is amazing to think about how much we have grown in these three years, and for that, we thank all of you! 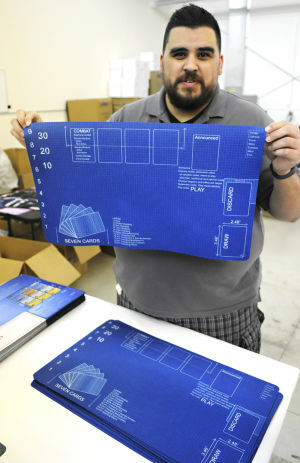 Corvallis-based Inked Playmats had sales on its website before last Friday, but its “Spring Fever” sale was different: it went viral on Reddit.com, and the fledgling company did three months’ worth of sales in a single day. Inked Playmats owner Thomas T.C. Pool said the company mostly has become known through word of mouth, and he was surprised the sale took off the way it did. He theorized that the sale went viral because the company is gaining a reputation for customer service and custom products in its niche market. Pool said the business began with his love for Magic, a popular fantasy card game. He likened its development to watching a child grow. Pool started the business in his garage after attending tabletop gaming conventions and being disappointed with how little variety there was in the mats gamers use for placing their cards. Pool said he bought his original printing and pressing equipment on Craigslist, and he built the company’s website as a class project while taking web development classes. “I figured in friends alone I could sell enough to make up the equipment costs,” he said. Pool launched the site, inkedplaymats.com, in October of 2011. The business grew to the point where it no longer fit into Pool’s garage, and the Albany native moved the business into its own location in November. The company now has six employees and gets thousands of orders a month. In addition to selling directly to customers, Pool said artists and game companies order from Inked Playmats in bulk to sell, or take to conventions. Pool has been upgrading his equipment as the business has grown, including the purchase of a $30,000 printer a year ago. He is in the process of upgrading his press, which sublimates dyes into the mats and other products, such as custom mouse pads and dice bags, to a quality that will allow the company to go from producing 40 to 50 mats an hour to 400 mats an hour. Pool said Inked Playmats has customers that include artists and companies he was a fan of before he started his own business.